Over 40 Certification" -- In the mid seventies the TLBAA board started the "Over 40 Certificate." It was believed that less than 5% of bulls and cows registered would measure over 40" T2T. A half sheet certificate with blue letters was designed. If a member measured their cattle with another TLBAA member-witness it could be sent in with a $5 fee and you would receive a numbered "Over 40" certificate. Many herds did not have a single "over 40." 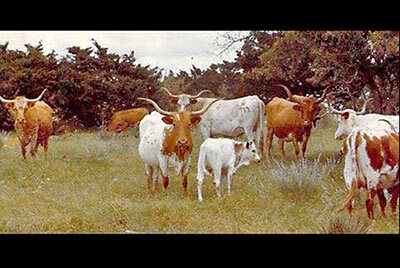 The DCCI herd had 8 when the first O-40s were submitted. This photo shows the queens of the YO Ranch herd -- the envy of the industry. Charles Schreiner III jumped right on the O-40 craze and had 22 qualify with one cow 21 years old. Those who did not have 0-40s said it created too much emphasis on one factor and eventually political pressure caused it to be terminated. Back at this time there were no over 50s.